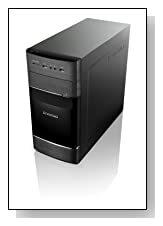 The Lenovo H535 is a desktop PC with a powerful AMD A10 processor, very large amounts of system memory and storage space, comfy AccuType keyboard, 5.1 surround sound, built-in AMD graphics processor suitable for the advanced games and multimedia despite being a fairly low-cost system in a medium case design. AMD A10-6700 processor at 3.7 GHz speed, 8 GB DDR3 RAM memory, 2 TB Serial ATA II hard drive at 7200 rpm rotational speed, Windows 8.1 operating system. The quad-core processor, RAM and hard drive will allow you to perform any daily or more demanding tasks quickly and efficiently. The processor comes with 4 MB cache memory for easy access of the microprocessor to the data and faster processing. 8 GB RAM allows for all the multitasking you want- to run several apps, programs and tabs simultaneously without delays. Storage space is quite a lot at a total of 2000 GB and it is a SATA II that works at 7200 rpm- which is faster than the regular 5400 rpm speed for read/write. You also have the Lenovo Cloud storage to have access to your data from any device wherever there is an internet connection and to automatically back-up and protect them. DVD-RW Optical Drive (Dual Layer DVD Burner for CD DVD recording and playback), 6 x USB 2.0 Ports, 2 x USB 3.0 ports- fast digital data, video and audio transfer, HDMI output, 6-in-1 media card reader, 802.11bgn high speed wireless LAN, 10/100/1000 Mbps Gigabit Ethernet for easy wired connection, VGA port to connect to monitors and HDMI port to your HDTV.. 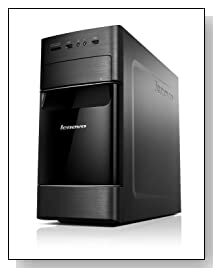 Conclusion: Lenovo IdeaCentre H535 is a nice and modern looking, medium to advanced level desktop with a budget price. It comes with technical specs and features that will make it easy to perform all your daily tasks, multimedia editing, running demanding programs and playing those latest games. 2TB at 7200 rpm hard drive is huge and fast, 8 GB RAM is great for multitasking, the quad-core A10 processor with a big 4 MB cache runs at 3.7 GHz speed.. It is a very decent and robust system with a nice price tag. Definitely recommended!